A light-filled condo renovation created a welcoming resting place for a couple who live in Hingham and work in Cambridge. The E5 light fixture with clear glass globes by Studio PGRB was designer Lindsay Vieira’s starting point for the living room. The woven camel suede chair is from CB2. Lelah Manz and Kevin Willis work in Cambridge, travel often, and own a home in Hingham. 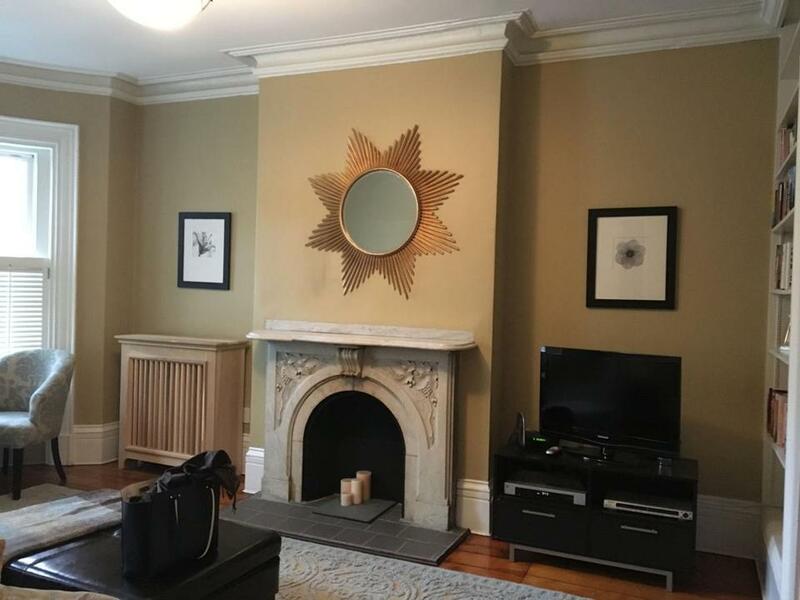 They loved having a South End spot to retreat to when their schedules became hectic, but their condo there was dark and disjointed. The layout was awkward, with the living room and master bedroom on the parlor level and the kitchen and guest bedroom on the floor below, making entertaining a challenge. Worse, smack in the middle of the lower level was the mechanical room for the entire building. A hunt on Houzz turned up Jeff Swanson of Boston-based Renovation Planning & Interiors, who suggested relocating the mechanical room beneath the building’s front stoop. After some negotiation, the condo association signed off on the plan, and Swanson contracted Benjamin Construction to gut the unit and relocate the systems. Counting the 75 square feet picked up from the boiler room, Swanson now had 1,455 square feet to play with. “With the mechanicals out of the way, we could take a fresh look at the entire space,” he says. He decided to dedicate the parlor level to the living room and kitchen, designating the garden level for the private spaces. 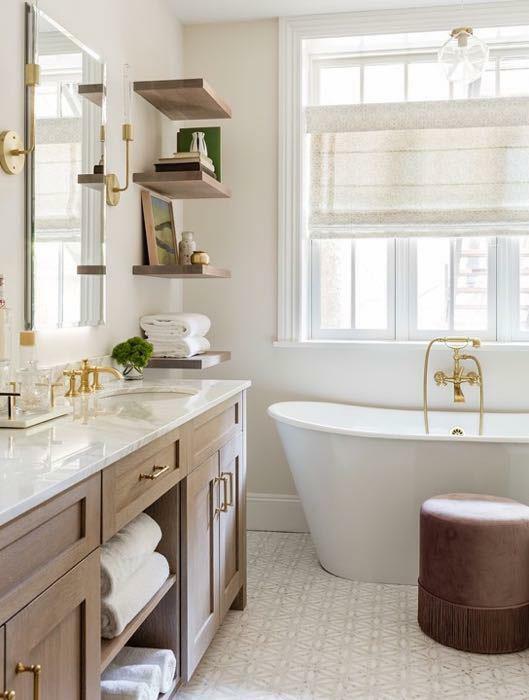 Brass fixtures, including sconces from Cedar & Moss, adorn the master bath. It has a cerused oak vanity, a marble mosaic tile floor, and oversize windows behind a sculptural soaking tub. “It’s all about warm tones,” says Vieira. A newly arched opening leads from the small entry into the light-filled kitchen, with pale-gray cabinetry and a center island topped with Calacatta Gold marble. Swanson enlarged the windows on the back wall and added a door to the new deck. He transformed the original master bath into a powder room, allotting the leftover square footage to a pantry. 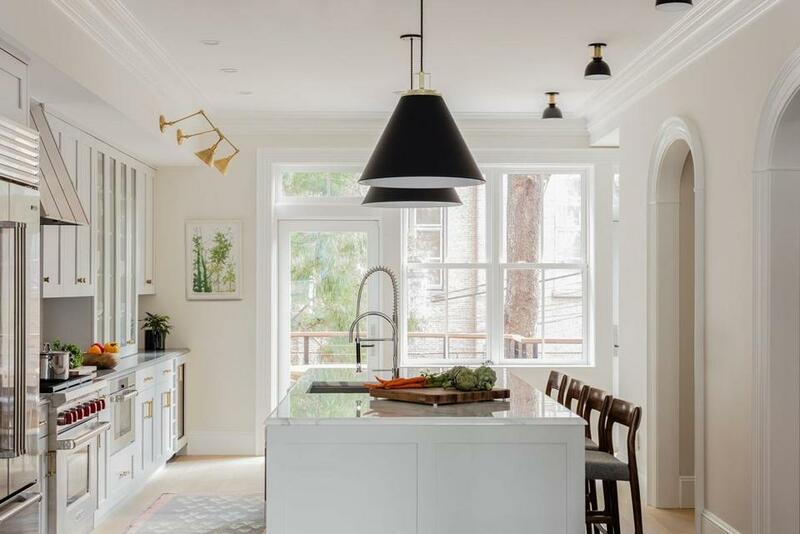 The kitchen and the lower-level rooms gained crown molding based on the original in the living room, restoring order out of a mishmash of trim styles. Swanson’s associate Lindsay Vieira devised the color scheme, finishes, and furnishings. 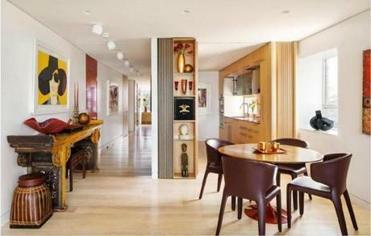 The décor pays homage to traditional South End style, with an infusion of mid-century modern zing. A blue velvet sofa with clean lines makes a statement in the living room, softened by a pale blue, salmon, and ivory vintage rug layered over jute. The focal point is a dreamy abstract painting, Pink Fog by Karen Smidth, a Dane living in Northern California, where Manz grew up. “It’s a powerful piece for me,” she says. A second arched opening leads from the kitchen to the lower level. During his initial investigation of the boiler room, Swanson discovered 30 inches of empty space below the subfloor. Benjamin Construction tore up the entire lower-level floor and rebuilt as low as possible, gaining almost 2 feet in height. The downstairs rooms now boast 10-foot ceilings. Ralph Lauren swing-arm sconces highlight the china cabinet, and oversize aluminum pendant lights from Rejuvenation hang over the island. Simple flush-mount fixtures from Schoolhouse illuminate the counter seating. Swanson tweaked the layout of the guest room, reclaimed the mechanical-room space for a new guest bath, and turned the old bath into a laundry room. The spacious master bedroom suite takes up two-thirds of the lower level. It has a spa-like bath with a cerused oak vanity, a marble mosaic tile floor, and oversize windows behind the sculptural soaking tub. The bedroom, which opens onto a stone patio, is a romantic space with a four-poster bed, a shaggy Moroccan-style rug, and a new gas fireplace framed by a stone mantel that was in the original master bedroom. Vieira worked closely with Manz to choose the custom de Gournay wallpaper. “You feel like you’re immersed in the trees,” says Manz. 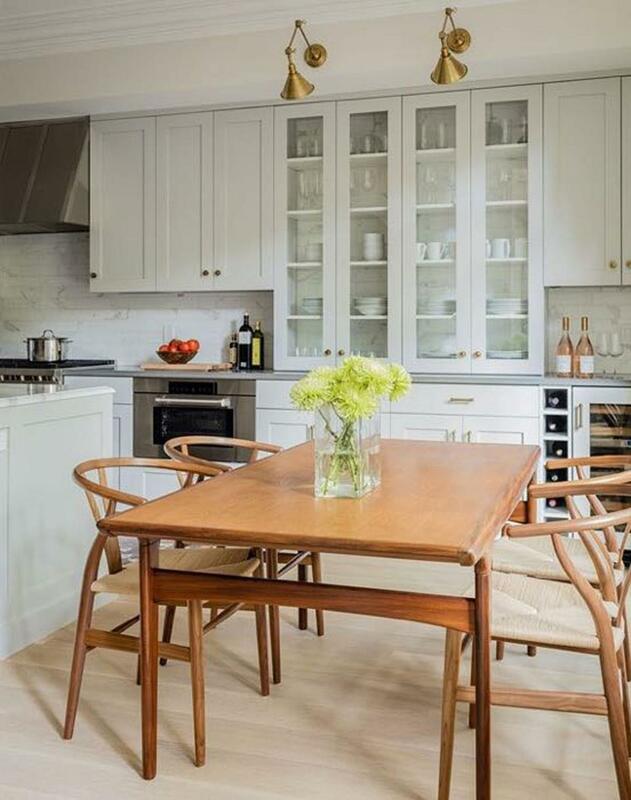 Wishbone chairs surround the vintage Danish modern dining table. BEFORE: The living room, pre-renovation. 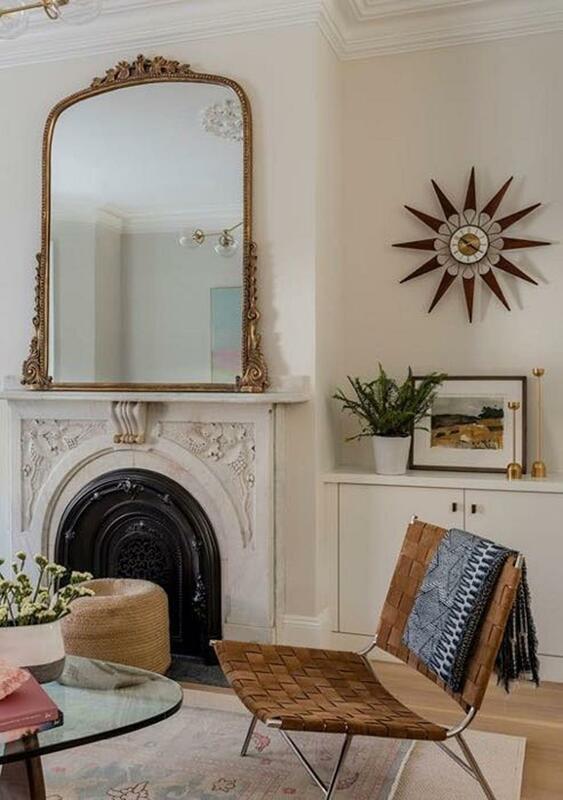 AFTER: In the living room, an ornate gold-framed mirror from Anthropologie now adorns the original stone mantel, and a vintage 1950s brass-and-teak starburst wall clock by Elgin hangs over a new built-in cabinet.